Railway Branded Gifts, Highland Sweet Treats and Much More ! Step back in time and board our Vintage Diesel Railcar. Back in time to the days before the modern commuter train services. The Strathspey Railway invites you to travel back in time as you journey through the heart of the Cairngorms National Park. The Park boasts a spectacular catalogue of nature, culture and heritage which includes Britain's highest mountain range, its biggest and best ancient forests, wildlife such as red squirrels, reindeer and ospreys, and so much more! What better way to explore this magnificent locale than on board one of our vintage trains. Aviemore developed as a small village after the Inverness & Perth Junction Railway (from 1865 the Highland Railway) opened in 1863. During the next few years a handful of houses, primarily for railway staff, a post office and a general store were built. The period of development saw the station became the main junction between the new route to Inverness and the old route via Boat of Garten. Aviemore’s role as a main line junction ceased with the closure of the route to Forres in 1965. Today the railway operates from the beautifully restored Victorian Station located in the centre of the village. Remember that we have plenty of fantastic gifts, sweet treats and refreshments available in our Aviemore Shop - be sure to pay us a visit before and after your trip ! Select 'Dining On Board' above if you wish to make your trip on board extra special with one of our exclusive Dining Experiences! Enjoy A Unique Dining Experience In The Heart Of The Scottish Highlands! Serving the best, local, Highland produce, our various Dining Experiences invite you on a trip like no other as you take in the stunning views of the Cairngorms National Park. 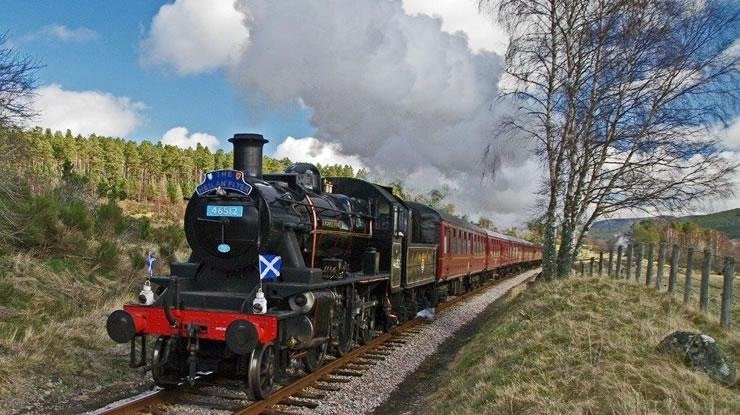 A delicious meal is served from our exclusive restaurant coaches as our historic engine takes you on a leisurely trip through the UK's largest National Park between our Aviemore, Boat of Garten and Broomhill Stations. You will also steam alongside the River Spey - Scotland's fastest flowing river and the country's second longest. Take in the glorious views and you can even enjoy some of the finest malts and whisky served on board, famous the world over and all distilled just a few miles further up this river. Travel in First Class, Vintage Style! Travel in style in your very own private First Class compartment. Sit back and relax as we invite you on a vintage dining experience like no other, through the heart of the Scottish Highlands. The train steams alongside the River Spey - Scotland's fastest flowing river and the country's second longest. Take in the glorious views and enjoy the finest Speyside malts on board. The Strathspey Railway once served the numerous distilliers that operated in Speyside and enabled them to export the finest Scottish whisky to the world. Playing host to over half the distilleries in Scotland, Speyside has the greatest concentration of malt whisky producers compared to every other whisky producing region. The best selling sinlge malt whiskies in the world. The Glenlivet and Glenfiddich, come from Speyside. Come along and enjoy a Whisky Tasting Experience on board our heritage trains!